Delegates to a United Nations summit agreed today that a U.N. body should take a more “active” role in shaping the future of the Internet, a move that had been opposed by the United States and its allies that had warned of greater government control. The agreement by delegates from the International Telecommunication Union’s 192 member nations, a majority of whom raised their placards in support of the language, took place after 1:30 a.m. local time in Dubai. 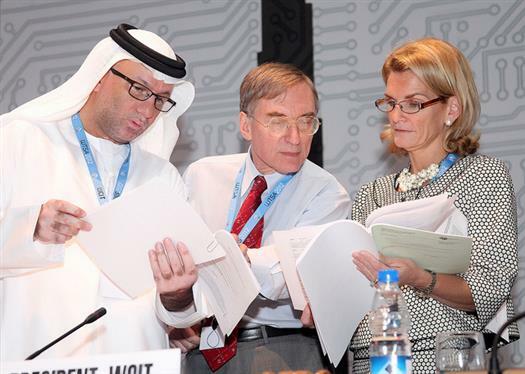 It came after the head of the ITU, a U.N. agency, had promised not to hold votes on controversial topics, and appeared to take the U.S. and Europe by surprise. The early morning vote seemed to confirm the fears of civil liberty groups, which had warned in advance that many countries participating in the ITU process had less-than-favorable views toward freedom of expression and the traditionally free-wheeling Internet. Two-thirds of the world’s nations, for instance, according to Reporters Without Borders’ 2011 ratings, have significant “problems” with press freedom. A lot of the governments represented fear the Internet, as well they should, since their populations are free to get information on the Internet that’s not be sanitized by dictators, mullahs, and bureaucrats. The U.S. will probably come out of this fine, but the vast majority of the world’s population is in danger of having their one lifeline to free information destroyed.